Many are already aware that there is an “economy of investment.” That you receive proportionately to your investment was renewed for me by the recent solar eclipse. There were plenty of opportunities to invest. The local library (one block from my office) had an “eclipse party.” They provided the needed glasses and eclipse shaped cookies. Obviously, the internet and television were also available. There are also plenty of boxes available, since we are still getting settled from our recent move. I chose to limit my investment. No one else can be blamed. I made the decision to keep working in my office. Therefore, my experience was also limited. Yes, I did walk outside a couple of times and looked up — without glasses. That is why what I observed, what in this area was a very slightly darkened (almost hazy) atmosphere, was not very impressive. 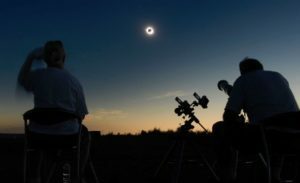 Others made investments ranging from shadow boxes to driving many miles to experience the total solar eclipse. The extent of their investment was rewarded in keeping with the economy of investment. While many were not highly impressed, others were blessed abundantly. Those experiences have been expressed in multiple ways, including a variety of posts on social media. In Paul’s letter to the Christians at Rome, he makes it clear that believers have an investment to make (in view of the wonderful salvation of which he has been writing – “therefore“). It is not working to earn salvation or a blessing. Yet, notice again how it is our task is to “present… not be conformed… be transformed by the renewal.” We need to invest/respond with wholehearted commitment.